GBP1 (guanylate-binding protein 1) hydrolyzes GTP to GMP in 2 consecutive cleavage reactions. GBP1 exhibits antiviral activity against influenza virus and promote oxidative killing and deliver antimicrobial peptides to autophagolysosomes, providing broad host protection against different pathogen classes. 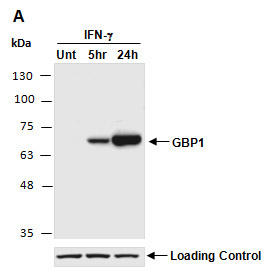 Rabbit polyclonal antibodies were produced by immunizing animals with a GST-fusion protein containing the C-terminal region of human GBP1 protein. Antibodies were purified by affinity purification using immunogen. 5hr or 24hr as indicated, using anti-GBP1(C1) (R3725-1) at RT for 2 hr.